Rochelle was back in Bermuda for Christmas and we got together for a quick shoot. 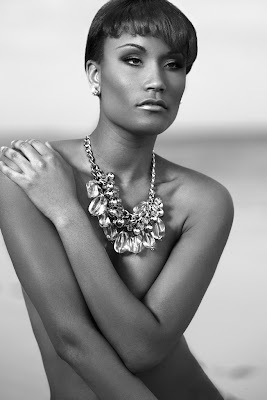 We needed a simple concept as we had little time for planning, so settled on a David Yurman inspired jewelry shoot. We used a couple of pieces that Tiara loaned us for the shoot. Make-up was done by Afroditi and Matt Kendall kindly offered to assist. The shoot took place on Tuesday 27th December at 1.30 pm. The weather was bright and sunny with a little haze. The bright sunlight was creating hard shadows and was metering at F13 at ISO 100 and 1/100 sec. My desire to have a shallow depth of field and to shoot at F2.8 meant I needed to drop the exposure by 4.5 stops. A 2 stop ND filter was added, another stop was saved by dropping the ISO to 50. The remaining 1.5 stops was achieved by increasing the shutter speed to 1/350 sec. I used the 64" Parabolic reflector as the main light source, triggered by the PW Mini which enables a sync speed of up to 1/500 sec. As the light fluctuated due to the clouds, the ISO was moved back to 100 and the shutter speed slowed as needed.